A counter strike 2v2 ladder is where real FPS skills shine. Every round already resembles the end-game clutch situations of 5v5 matches. 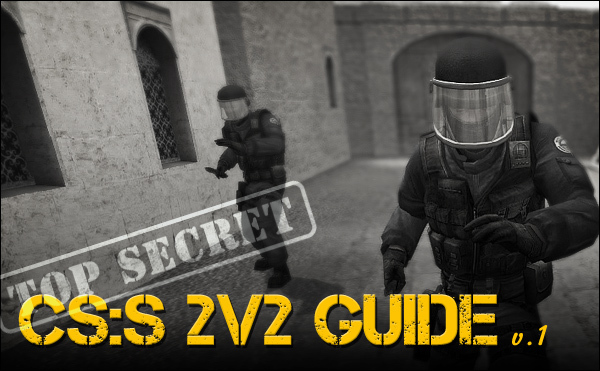 CS 2v2 comes down to patience, coordinated aggression and excellent match sense. A 2-man rush stands much less of a chance against a single defender than a 5-man rush does. At the same time, the map becomes bigger as there are less players fighting it. This increase in flexibility and options brings a new variable to the table; great uncertainty. Many teams fall apart largely due to the reasons I list below. Forget your 5v5 strats, you don’t have an army backing you up, watching your flanks or giving you enemy locations, it’s just you and your friend. My 5 point strategy below sums up the tactics I have used for years on end to win my fair share of games despite my amateur aim. Read them, apply them and dominate your 2v2 league. 1) You are the Weakest Link, Goodbye! Once you kill one player, 50% of your work is done and your chances of winning that round have just doubled (assuming all players are of equal skill). As such, you always want to identify which of your two opponents is the easier kill. You can feel out which one is weaker in the warm-up and in the first few rounds of the game (or if you’re really enthusiastic and your game is important, you can watch demo’s of their previous 2v2 matches). On the other hand and in my experience, strong players are quicker to rotate to their weaker teammate. You can use this to your advantage by baiting the stronger player away from a bombsite which is maybe easier for you to hold once planted. Target the weakest link and be quick to take him out, the faster the bomb goes down, the better your chances are. Whilst some teams won’t react till they see their nemesis, others will throw nades back, run around or even rotate and abandon their position. Play on these sort of insecurities, if your opponent has used up their flashes thinking that you were going to rush in, he’s 1) Given away his position, 2) Doesn’t have any more flashes to slow you down (in which case you won’t have to worry about his backup getting there in time). More often than usual, CT’s will play a tight formation (Dust2 Example: 1 on Short A, 1 Mid-B) which leaves the routes on the edge of the map open. Your plan should be to get in as deep as possible on one of those wide ends, checking every corner going in and then bunkering in waiting for the scanning CT to make his check on that part of the map. By then you’ll already have your crosshair lined up for the HS. As soon as you execute, waste no time getting that bomb down. As mentioned in the point above, sound is not only important but it means everything. CT’s will rely on their headphones to defend multiple areas at the same time. More than once have I crept Long A for its entirety only to find a CT looking towards Short A crouching behind the box closest to the Bombsite A ramp. Till you initiate contact you should remain a 100% silent, let your opponents give their position away and use that to your advantage. Punish enemies which don’t know how to adhere to this rule; they take a step, scope in or pull their knife out, your task is to listen for it and then go for the easy kill. A defensive 5v5 strategy is usually quite predictable, however 2v2 strats are like playing the lottery. Teams have to cover a lot of ground and are likely to be rotating between various spots. Take Dust2 for example, will the CT at Bombsite B play mid-heavy or camp on site? This is where your 3rd player comes in, the SourceTV spectator. You can either watch the opponent’s previous demo’s if it’s an important game or if you’re really desperate a friend on could be able after a couple minutes to let you know which defensive positions your opponents are scanning, and more importantly which ones they’re not (often a Short A CT will rely a 100% on sound to cover Long A, which is a mistake as sound is everything in 2v2). In closing, I’d love to read about your strats, see your 2v2 videos or hear about your wins, so please feel free to comment below (or ask any questions). got any good suggestion on a CSS 2v2 ladder? Or where to find them? Previous post: Decoy Sprays are absolutely HILARIOUS! Next post: Want a 4 Digit Steam ID?